One foot of rushing water can carry away a small car, like this one submerged in floodwaters. Floods are among the most common natural hazards faced by Philadelphians. Flooding tends to occur more rapidly in urban areas, where water runoff is two to six times greater because there is less green space. Extreme weather storms, like hurricanes, tropical storms and thunderstorms, can dump heavy rainfall in a short period of time. They can be particularly dangerous. More than 130 people in the United States died in floods from October 1, 2016 to September 30, 2017, according to the National Weather Service. Each year, flooding kills more people than any other storm-related hazard, including lightning. And more than half of those deaths occur when a vehicle is driven into floodwaters. In addition, vehicles end up in the Schuylkill and Delaware rivers every year. • Never attempt to cross a flooded area. Floodwaters can be quite powerful. Six inches of fast-moving water can topple an adult. A foot of moving water can sweep away a small car. Two feet will carry away most vehicles. • Know where flooding regularly occurs, and where you can check flood gauges for nearby rivers and streams. • Attempt to point your feet downstream. • Always attempt to go over obstacles to prevent yourself from getting pinned under the obstruction. • Grab onto something, if possible – your life might depend on it. • Make as much noise as possible. Never give up. • Remain as calm as possible. • Roll down your window as quickly as possible, even before you hit the water, if you can. 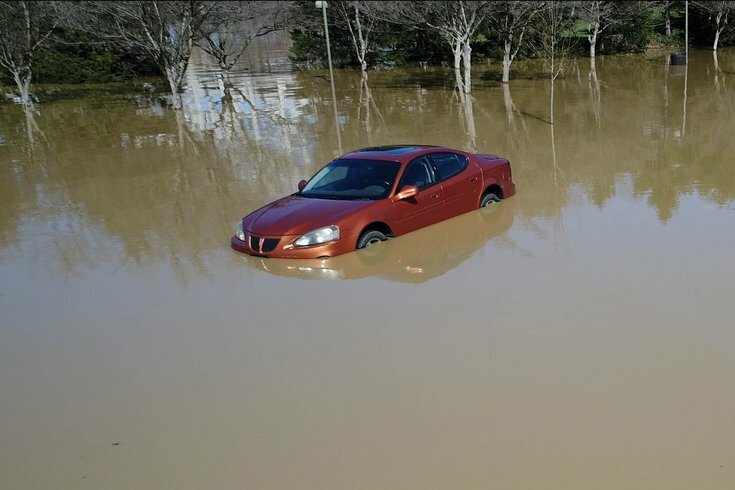 If your car is submerged, thousands of pounds of water pressure will make it difficult to roll down the windows and open the doors. If you can't roll a window down, use a hard object or a window smasher to break out, or kick out the window. • Without water able to flow into the vehicle and equalize the pressure on the outside of the car, you will become trapped. • If possible, turn on your lights and hazards. • Unbuckle your seat belt, abandon your vehicle in place. Once outside the vehicle, search for higher ground. • Do not return to your vehicle, even if water begins to recede. • Know if you live in a flood zone. The Federal Emergency Management Agency designates flood zones and risks. Philadelphia residents can receive free emergency alerts by joining the city's "ReadyPhiladelphia" mass notification system. Sign up by visiting www.phila.gov/ready or texting READYPHILA to 888-777. • Residents who live in areas prone to flooding should consider flood insurance. Flood losses are not typically covered under a homeowner's insurance policy. A few inches of water in a 1,000-square foot house could total more than $10,000 in damages. • To mitigate flooding, Philly residents can sign up for the Rain Check program, which helps residents manage stormwater by adding rain barrels, rain gardens and downspout planters. • Alert the Philadelphia Water Department to any clogged sewer inlets by calling 215-685-6300. Clearing litter and debris helps keeps inlets clear.